York's art scene is as varied and diverse as its many artists, with a mix of private galleries, public displays, and outdoor murals and sculpture. If you're considering a visit to York -- and if you're not, you should -- then consider dipping your toes into the variety of York's artistic offerings! benches, garbage bins and planters -- along Beaver Street. Work it into your plans or spend an afternoon exploring the arts in York! Located in the Royal Square District, the Parliament Gallery is just one part of Downtown York’s creative arts community. Right next door is the King's Courtyard Artists' Collective, an eclectic art gallery and studio space. If none of the doors are open to the back (in any of the three galleries), ask to explore back there -- there's a sweet little courtyard and you'll be able to see another amazing mural. Go up the steps toward the parking lot, and you'll soon find a number of other murals -- so much fun! 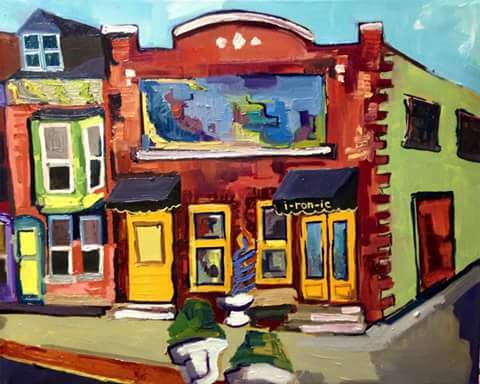 Getting there: Parliament Gallery is located at 116 E King St, York, PA 17401; King's Courtyard is located at 124 E King Street, York, PA; and Hive Artspace is located at 126 E King Street, York, PA. This coffee shop and art and thrift boutique is the perfect introduction to Downtown York. Start your day with coffee and breakfast as your browse the sculptures, paintings and other art found in this trendy shop in the city’s WeCo neighborhood. The atmosphere is eclectic and cozy in the best way. We made this our first stop, picking up a hot cup of joe -- but we could have had a hot chocolate, expresso or latte -- in a variety of flavors. In addition to providing a venue to local artists and artisans, the coffee shop offers a variety of breakfast pastries and lunchtime offers (sandwiches, soups, and salads). Food and art -- that's singing my song. Art is an important part of The Handsome Cab's schtick, from its retro industrial hip decor on the main floor to its support of the art gallery and artists' studios on the second and third floors. Take a glass of wine, cocktail or beer to the Cab Art Gallery on the second floor, and explore the artists' studios on both the second and third floors of the building. ​The Cab boasts local artists and showcases amazing talent in the local community and around the world. Variety of titles, Lisa Madenspacher, acrylic, oil, water color. There are some 40 murals scattered around downtown York (mostly on the Market Street corridor) but there are some cool "retro rustic" metal sculptures that spoke "steam punk" to me and fascinated my husband, who is totally into steam punk. On our way to I-ron-ic coffee shop, we passed by a cool little park -- Foundry Park on the Codorus -- next to Codorus Creek, with metal flowers and a yellow cat. 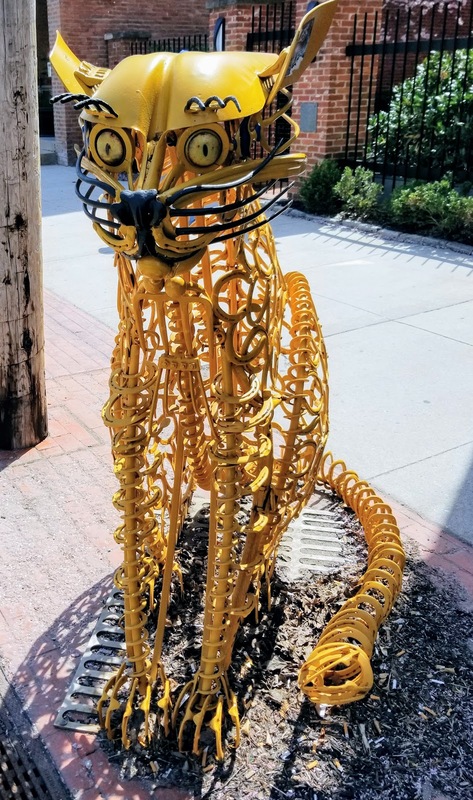 There's another yellow cat on North George Street too, as well as Tinker and a Curb Dragon rising out of the sidewalk. Crafted from components of equipment that defined York as an innovative and industrial manufacturing center, these whimsical sculptures tell York’s story and speak to the city’s heritage. Another Wonderful Maryland Lake to Kayak!